In the early yrs of 5-0 , Moe was pulling cable on the set. One day the casting director came to Moe and said Jack wanted him to do a part in an upcoming episode. Moe said thank you but i am not an actor. The next day Moe was called to Jack's trailer, and basically Jack said Moe you will do this part-(as you know no one said no to Jack). Much to his chagrin Moe did the part and that was the start of his acting career. He did many guest parts -normally bad guys the first 10 yrs. then the last year when they changed the 5-0 team -Moe became Truck Kealoha -taking Kam Fongs place. Maybe out of innocence -I am not sure Moe had no fear of Jack , plus Marie fell in love with Moe because when she would come to the set (everyone else was afraid of her) Moe would run up to her- pick her up and twirl her around- she would giggle like a little girl- I think to Moe it was simply sharing his Aloha with her. They invited us out to dinner several times and treated us with great respect-I think Jack appreciated people that treated him like a regular guy-instead of living in fear of him. As Moe always said it was Jack that taught him how to act,how to behave on set etc. Jack did a pilot called "M-Station Hawaii" after 5-0 and he gave Moe a lead role as a college educated Hawaii- an oceanographer- it was the first time a Hawaiian had a part where they were portrayed as an intelligent character. Unfortunately the show wasn't picked up. Then they did the 2nd 5-0 Pilot and Moe, Jimmy, Kam fong and Zulu had parts in it as the "old" 5-0 team stepping in to help the new 5-0 team-it was a great pilot with a great story line, but Gary Busie was one of the leads, he was not a nice guy and had serious drug and alcohol problems, just before they aired the pilot they found he had cancer in his nose- can't be sure but most people felt that was due to snorting cocaine- they had to cancel the show. Moe did quite a few other shows and pilots but none could compare to 5-0. It was fun to watch Moe start on a new show, the Hollywood actors tended to be a bit standoffish- Moe naturally would arrive on the set and hug and kiss everyone- pure Aloha- it was a natural action that he always did when he met new people. 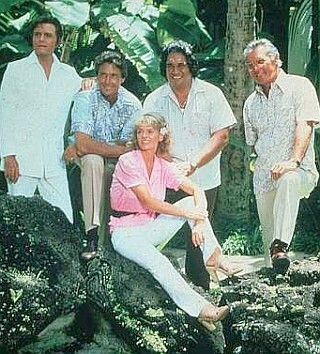 At first the mainland actors were taken aback, but Moe either didn't notice that or wasn't going to change his belief in Aloha he continued to hug and kiss everyone. After awhile, if he forgot to hug someone (this included the men) they would come up to him and asked where was their hug. By the end of a shoot everyone was hugging and kissing everyone else and hopefully they carried that back to Hollywood with them.